It’s time for ATS patch 1.33 open beta. After a period of a lot of stuff for ETS2, we now have something new for this game too. 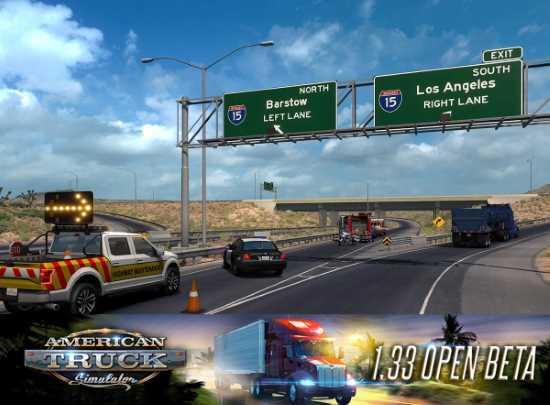 American Truck Simulator new update now has a lot of features which we are going to show next. One of them is really a game changer. Therefore, if you want to participate in this open beta test, check our guide below on how to install public betas. Detours: Simulators are all about realism. So when you are making a delivery everything is really predictable. You simply choose the route you want to take and go on your way. However everything will now change with the addition of detours. While driving, you now will encounter road blocks which will force you to remap your route. Similarly we have seen SCS starting to implement unpredictable events since the random road events. Trucks & Trailers: In American Truck Simulator you need to own a company. Therefore you probably want to have a fleet of trucks that all look the same. For that reason you can save your trucks or trailers configurations as templates and use them later. Map update: If you have the Oregon DLC, a new road is available to your map: OR-140 road. Physics & Graphics: Seems like the raindrops are quite important for many players. As a result they are now updated and they behave in a much more realistic manner in ATS patch 1.33. Also the physics of suspension, damping, braking, cogs are updated in a realistic way. Steam cloud based profiles: No more losing of your profiles. You can now save your profile into the Steam Cloud. Turnpike double trailers: You can buy these for use as personal trailers. Because of regulations, they are available only in Nevada. Other improvements: Music shuffling, Country and city names localization is updated in the main menu and g_disable_beacons (0/1/2) – for people that have issue with blinking lights. You need to update the ATS Mods related to these changes. Therefore we have a special section for the ATS 1.33 mods. Are you ready to experiment the new adventures? Let us know in the comments below. Keep on truckin’!